Transistors Killed The Valve - After A Struggle! The common misconception seems to be that the invention of the transistor, in long-ago 1948, killed the valve stone dead - and that was that. Big, hot, delicate power-hungry valves had had their day and the world was moving towards the space-age of miniature electronics. Cool, small, efficient and economic - the transistor ascended and killed the outmoded valve. The thermionic valve still lives in the form of the klystron for high power radio frequency transmitters serving radio and TV - as well as in your microwave oven (as the magnetron) and, perhaps, the CRT monitor you may be viewing this page on. But although the transistor had come into being in late 1948, it was some time before they were ready for commercial use. Early transistors suffered from poor reliability and high noise levels - making them unsuitable for high frequency, high quality or high power applications. Low grade consumer products, such as radios, were first to benefit from the new technology but the limitations of early germanium transistors restricted their use in TV's and hi-fi gear until the late 1960's. Laboratory grade electronic gear had to wait until the early 1970's to benefit. Although, strangely enough, the earliest mainframe computers of the late 1950's were transistorised. Many valve manufacturers had invested heavily in their equipment and processes - all of which was threatened by the emerging transistor. But in the the late 1950's, designers still had a few tricks up their sleeves. General Electric's engineers at Owensboro, Kentucky introduced the "Compactron." Compactrons are multi-function valves, combining diodes, triodes, and pentodes in various combinations, designed to reduce size and component counts in entertainment and industrial devices. Compactrons have 12 pins arranged around a 3/4-inch diameter base. Typical dimensions are 1-1/8 inch diameter and overall height ranges from 1 inch to 2-3/4 inch depending on the configuration. GE engineers claimed a two-Compactron radio design could replace a standard five-tube radio complement (seven transistors were needed for the same performance), or a 10-Compactron TV-set could replace 15 valves and three diodes or 24 transistors and 11 diodes. A seven-Compactron stereo design could replace 10 valves or as many as 26 transistors. American electronics designers clearly hadn't yet thrown in the R & D towel, even as the "space-age" was dawning. Several metallurgical advances enabled GE engineers to claim a 40 percent reduction in heater power. "A multi-function Compactron will eventually sell for 20 per cent less than an equivalent number of tubes," according to GE marketing officials. (Electronic Design, July 20, 1960, p. 74). For Construction Plans for a single compactron multi-band receiver - download this DjVu file (555Kb) with full DETAILS. RCA's introduction of the 'Nuvistor' vacuum-tube, heralded one of the attempts of tube manufacturers to hold onto a major portion of the small-signal amplification market. The Nuvistor is a thimble-sized unit (enclosed in a metal envelope rather than glass) that promised high-reliability, low-noise, and low-power operation. All of which it needed to have any hope of competing in the brave new solid-state world emerging when RCA introduced it in the 1959. Designed mainly for military and test-equipment applications, the Nuvistor bridged the gap between valves and transistors to ease the transition from hollow-state to solid-state. Unfortunately (for tube aficionados), the release of the Nuvistor appeared at the same time as the announcement of the first integrated circuit, and its fate was all but sealed right from the start. 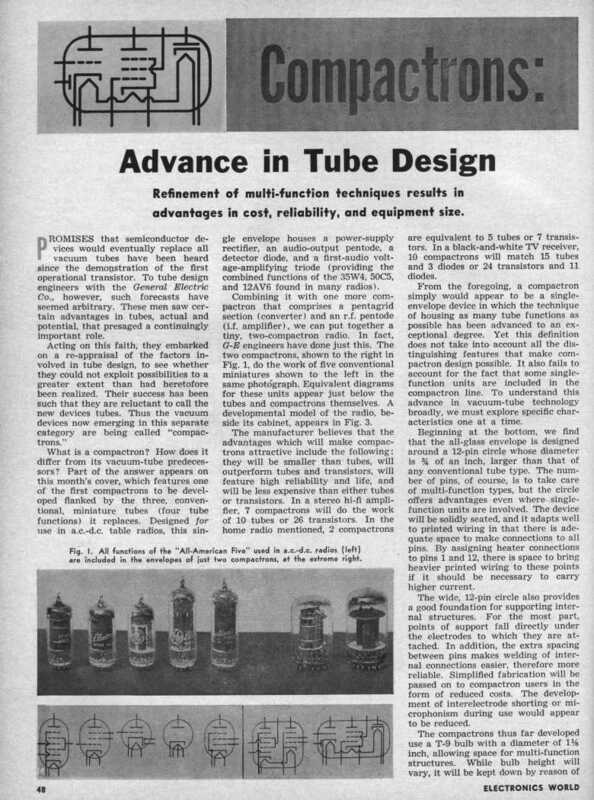 "Tube manufacturers have unveiled, in recent weeks, drastically new concepts and techniques aimed to keep them in the race with the transistor industry. Smaller than a thimble, more rugged and efficient than present tube designs, and particularly suited for mechanised production, the "Nuvistor" represents a radical departure in the electronic-tube concept. 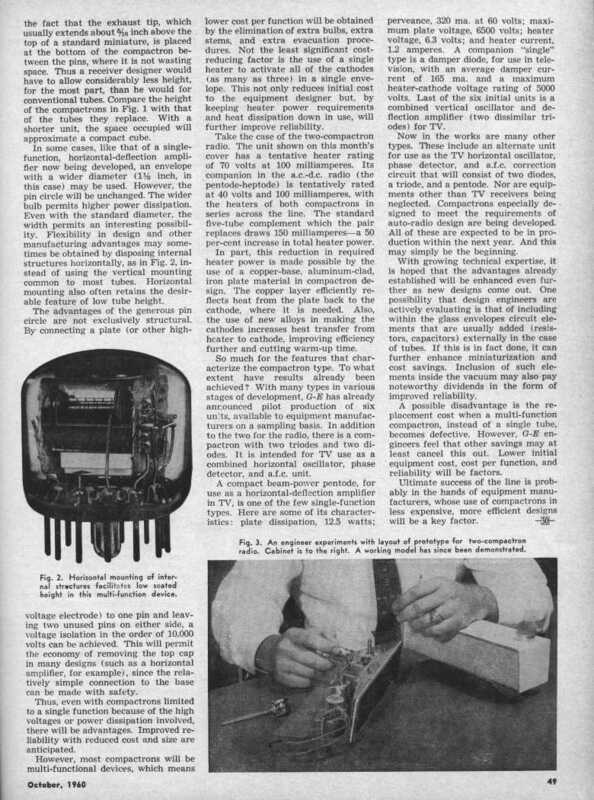 Developed by the RCA Electron Tube Division, triode and tetrode versions have already been demonstrated in TV tuners reduced to one -third the volume of conventional TV tuners." * Nuvistors, being in the tube family, are high-impedance devices -- circuit components are generally less expensive. * Lower noise figures and higher frequency operation are obtained. * Tubes can handle momentary overloads while solid state devices generally will burn out. * Stable operation is possible with Nuvistors over wide temperature ranges (-190 [degrees] C to 350 [degrees] C). " Propped up on the British 50 pence coin are a couple of Nuvistors. These are metal clad thermionic valves which were available in various guises, such as triodes (these examples) or tetrodes etc. 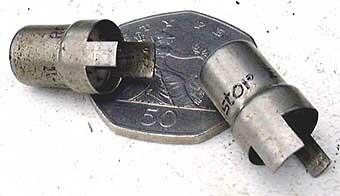 The valve, introduced by RCA in 1959 is claimed to be the smallest ever made. They have 6.3 volt heaters and have lower than normal HT requirements. Noise performance was excellent and has only been relatively recently been surpassed by transistors. The latter are now far superior to valves with noise figures typically of around 0.5dB at 12GHz but in the early days of transistors the Nuvistor was the only real option if one wanted good performance at VHF and UHF. The 6CW4 being a triode was not too easy to use to obtain its maximum performance as it needed to be neutralised; that is to balance out internal feedback to prevent it oscillating. Not only was the Nuvistor found in high performance VHF receivers it was also used in the popular Tektronix oscilloscopes of the 1960's in their wideband Y amplifiers where it happily co-existed with transistors.